Five years ago, the mascot of FAO Schwarz got made into a toy. Now it's TRU's turn! The world of awesome began with a sky filled with stars and a very special giraffe. Geoffrey learned his destiny was to bring fun to kids everywhere - and so, by following some magical stars - he found a new home, and new friends and Toys "Я" Us. There's been a Geoffrey even longer than there's been a Toys Я Us. Back in the 1950s, a store called Children's Bargaintown ran print advertisements that featured an illustrated giraffe - named "Dr. G. Raffe" - promoting that week's sales and specials, and sometimes simply proclaiming "toys 'r' us." Realizing that "Children's Bargaintown" was kind of a crap name, the company went back to the doctor's slogan and thus became the TRU we know and love today. At the same time, Doc apparently had his medical license revoked, because he started going simply by his first name, Geoffrey. Geoffrey's been redesigned several times over the years (including a turn-of-the-century stint when he was a Stan Winston animatronic voiced by Tom Hanks' brother Jim), but this figure is based on his current look, which really seems like it was designed to be accommodating to Flash animation - all angular in that Newgrounds/"early [adult swim]" kind of way. The figure is made by Schleich, so that means no articulation - just a solid lump of PVC. 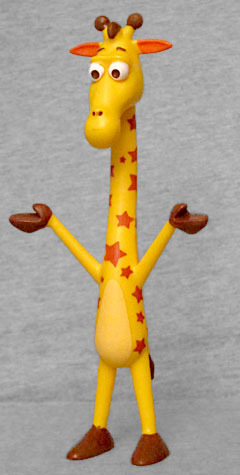 Geoffrey is standing in a celebratory, welcoming pose, with his arms held high and his... hands? Hooves? They don't have individual fingers, so they're not hand-hands, but they do have a thumb, so it's like he's wearing brown mittens; but they're the same color as his feet, so we have to assume they're biological, right? I'm pretty sure giraffes don't have lobster claws, so really we're just arguing semantics here. Call them whatever you'd like, they're turned palms-up, like he's just finished going "ta-da!" upon welcoming you into the store. 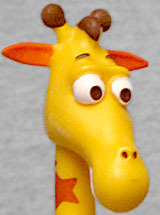 Geoffrey does have the giraffe's most prominent feature, its too-short neck. Yes, we said short. Giraffes' necks are too short. Look at the way any animal drinks water: mostly, they just amble up to it, maybe stand in it up to their ankles, and dip their head down to drink. Perfectly normal, perfectly natural. 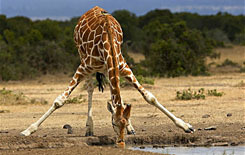 Now, look at a giraffe drinking water: it has to splay its front legs out in the most awkward way imaginable, making itself even more vulnerable to predators than most quaffing creatures already are; its neck isn't long enough to drink normally. Geoffrey's might be, though - compared to his scrawny little arms and legs, his neck is proportionally longer than real giraffes'. The name "giraffe," like "gorilla," comes from an African dialect, but nobody's really sure which one. It can be traced back through Italian to the Arabic zarafa, but after that the history gets fuzzy. We can say for certainty that it's not Greek, though: perhaps unsurprisingly, the culture that brought us minotaurs, griffins and centaurs thought that the giraffe was a hybrid creature; they called it a kamelopardalis, believing that it was the offspring of a camel and a leopard - the neck and the spots, respectively. 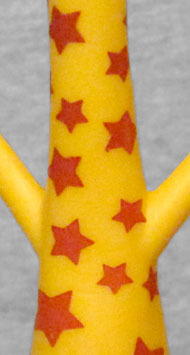 Geoffrey's spots are dark tan stars tampographed on his yellow body. His belly is a paler shade of yellow than the rest of him, and his ears are orange. His ossicones are the same shade as his hooves, but his hair is darker. 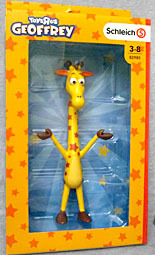 Geoffrey himself is 6⅜" tall, and is sold in a window box. The exterior of the box is yellow with orange stars, while the interior is a blue two-tone radial burst with yellow stars - the yellow figure standing in the middle of that is a nice contrast! The box measures 5½" wide, 9" tall and 2" thick. The back has the bio in eight languages, and directs you to the page on TRU's site where you can view his origin video. I recognize that this Geoffrey isn't "my" Geoffrey (that'd be the '80s/'90s version, obvs), but he's still Geoffrey. 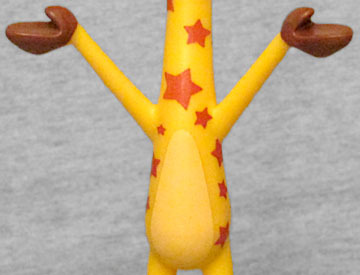 If you're a toy fan like we are, you've gotta have a Geoffrey! Between FAO Schwarz and Toys "Я" Us getting toys of their mascots, all we need now is for someone to make the friendly soldier from the KB Toys logo, and the trinity will be complete.